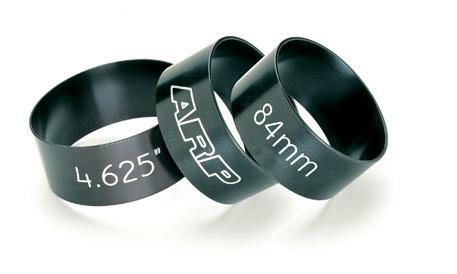 ARP’s new ring compressors are CNC machined from 6061-T6 billet tube material and feature a true radius for each different bore diameter. What’s more, they are relieved for wire O-rings on bottom. Type 3 anodizing is used for long life, and the bore size is prominently engraved in 3/4˝ high numbers for easy identification. Standard stocking sizes from 3.552˝ to 4.750˝ (SAE) and 75mm to 95.5mm (metric). The true radius design is far superior to conventional “tapered” devices, and widely acclaimed by professional engine builders! This is truly the very best piston ring compressor on the market today.